To feel truly captivated is a rare moment. To stand somewhere, look across the horizon, and be genuinely stunned by what you see makes travelling the world all the more rewarding. 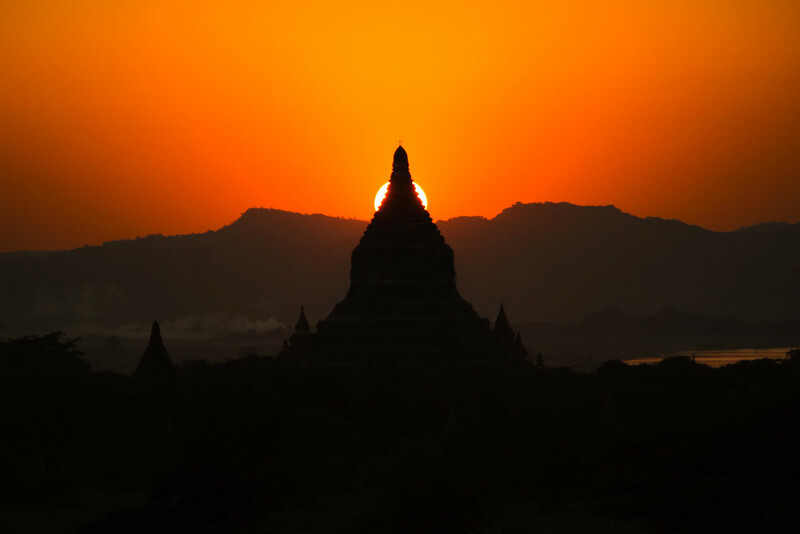 One such moment occurred just before sunset as we clambered up to the top of a temple on the plains of Bagan, Myanmar. There in front of us, around 3,000 temples were dotted across the vast plain, each its own unique shape. Many were leaning in one direction or the other, as the ravages of hundreds of years of rains and storms weighed heavy on their oft-times unstable foundations. We’d arrived a day earlier, sailing into Bagan in darkness after our 13 hour journey down the Irrawaddy river from Mandalay to Bagan, and this was our first full view of the temples in all their sunsetting glory. As the day drew to a close, the orange and red bricked temples began to grow into their colours, the low sun deepening and intensifying the already rich palate of bricks. Weaving their way around the temples were golden narrow strips of yellow dirt and lush green vegetation, incredible contrasts across the landscape. Adding to the sense of mystery and intrigue were the horse and buffalo drawn carts which kicked up the dirt from the paths, hanging in the air and enveloping the temples. And as the evening drew in, and the fires from the locals lit up the plains, the smoke added a final layer of suspense to an already incredible vista. We stood atop our chosen sunset temple (Shwesandaw Paya), and waited. As the sun finally dropped out of the sky, the light and colours changed minute by minute, providing a rich and varied set of colours throughout the sunset. Bagan, with its 3,000+ temples, is stunning, and in our opinion, even more impressive than the much more famous Angkor Wat in Cambodia. Yes, a bold statement we know and potentially a little controversial but why is this? Well it’s hard to quantity. 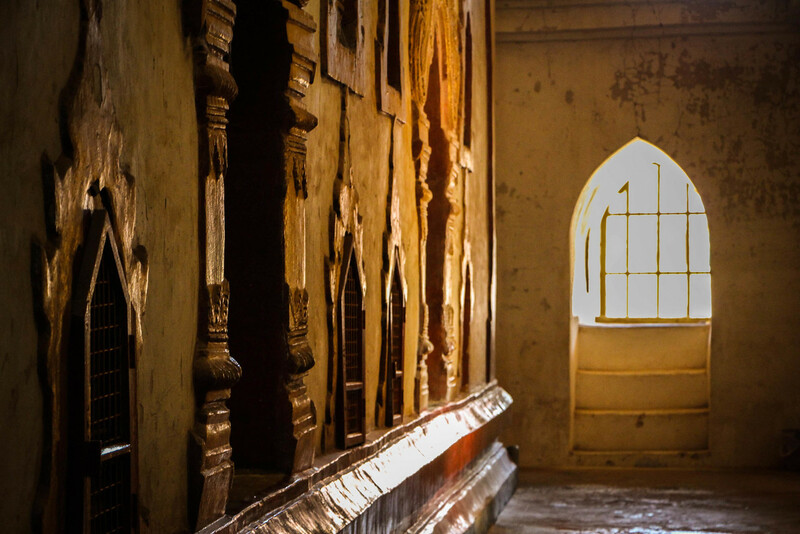 Perhaps it’s the fact that you can so easily escape the crowds and find many of your own little private temple moments, like we did at this one when there was no-one else around…. Or perhaps it’s the way the sunsets so beautifully, providing the most incredible view over the vast complex. Or maybe it’s simply that there are many more exciting ways for getting around this amazing complex! Whether its bicycle, car, bus, horse and cart, all options are open to you. But there was only ever one option for us, once we decided to create some of our own ‘motorcycle diaries’ on the back of two electronic bikes! Forget your Harley Davidson’s, this is the real deal… No-one can argue we don’t look cool on these bad boys. Um okay maybe not. But seeing Laura zooming around on her little e-scooter was, well, an absolute joy. I honestly don’t think she’s ever looked so happy, not even on our wedding day! 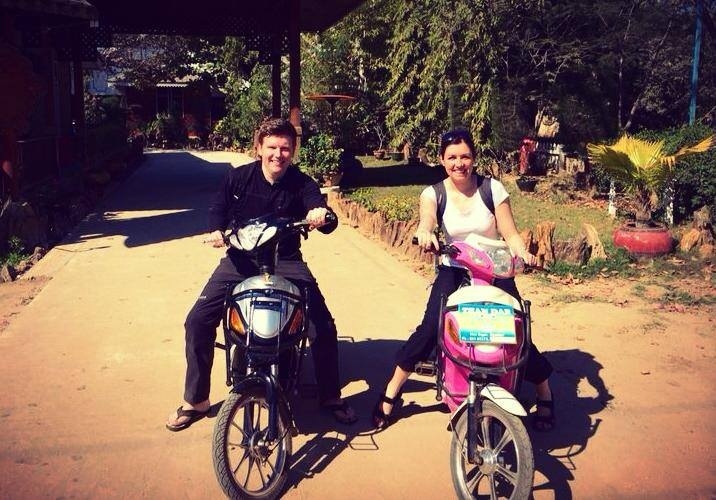 So it wasn’t a surprise that for our 2 full days exploring the various Bagan temples, these became our preferred method of transport (after first struggling in the heat with a pedal bike!) so we highly recommend these! 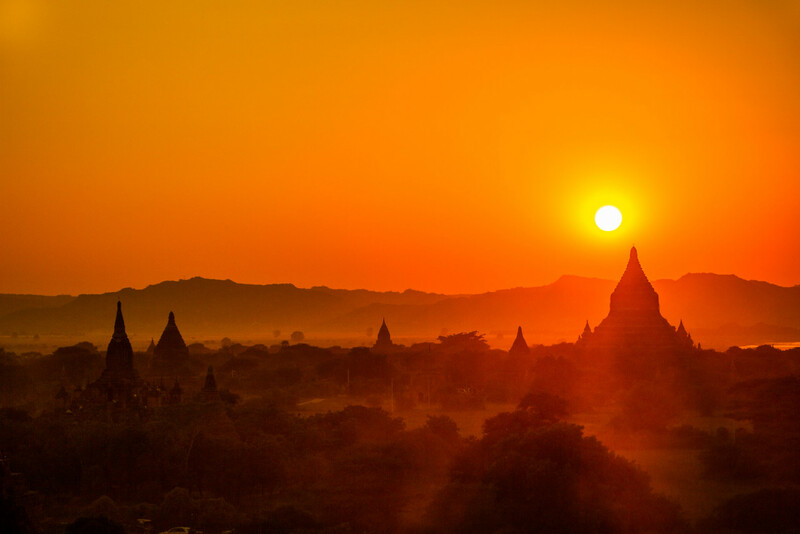 In terms of planning your time in Bagan, it’s physically impossible to cover all the temples in a few days (let alone a few weeks or months probably), so our advice would be: other than planning a couple of good sunset viewing spots for each day, and ensuring you make it to a few of the most impressive temples, just GO WITH THE FLOW. 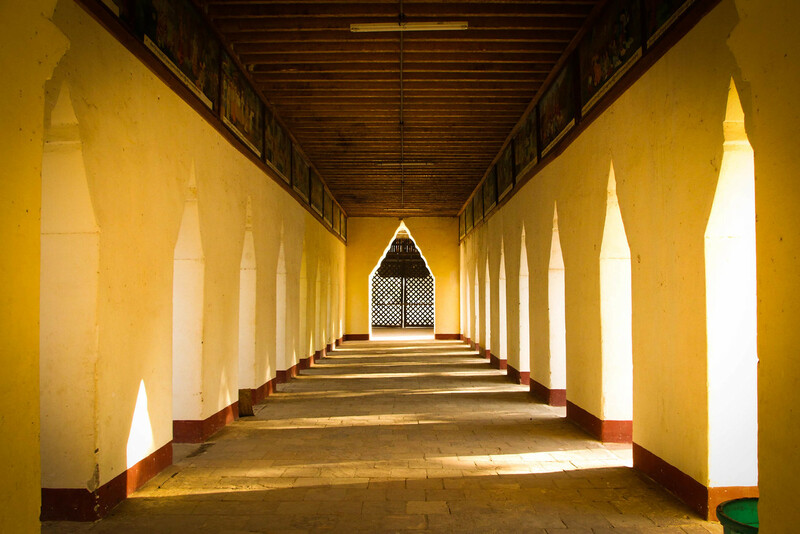 The best part of visiting this incredible historic site is discovering your own ‘off-the-beaten’ track paths and pagodas where you can simply park up your bike and sit for a moment enjoying your beautiful surroundings in peace and quiet. Just make sure that you have enough power (in your e-bike or legs) AND some daylight left after sunset to find your way back to your accommodation, as navigating the main roads in the dark along with lots of cars can be a little daunting! Trust us we tried it! 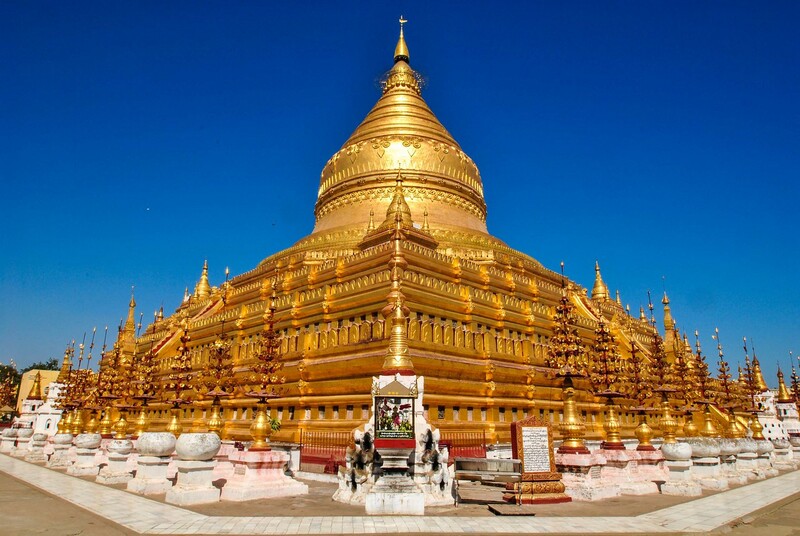 In stark contrast to the more weather-beaten temples you’ll find around Bagan, we were surprised to come across this rather shiny gold leaf-gilded stupa on our travels to the nearby town, Nyaung-U. 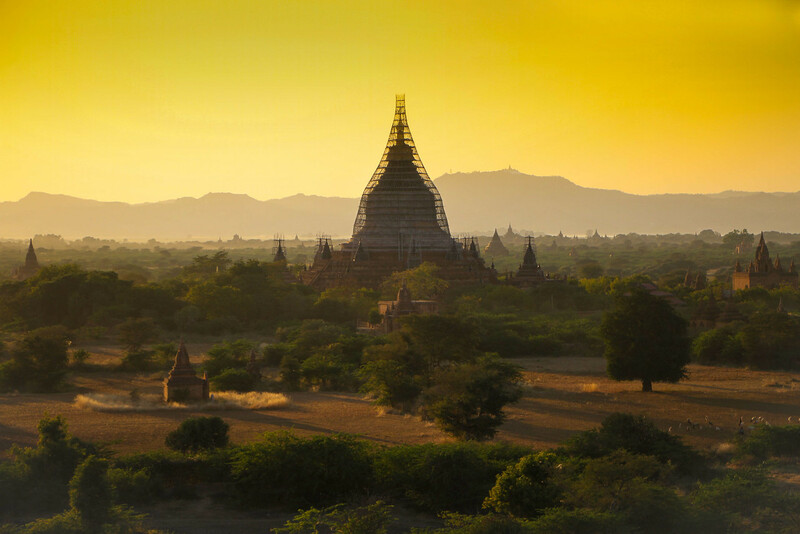 Despite its immaculate condition, this extremely grand stupa, otherwise known as Shwezigon Pagoda, actually dates back to 1102 AD, during the reign of King Kyansittha of the Pagan Dynasty, and was one of the first temples to be built. 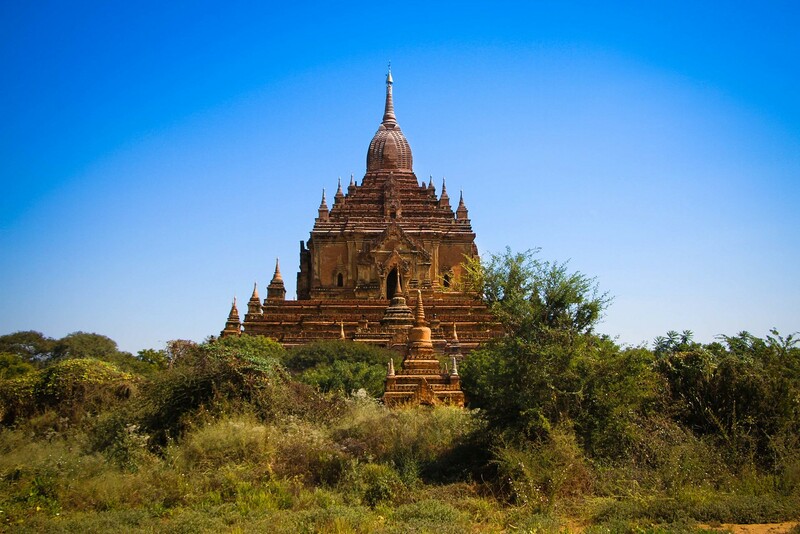 We found it incredible to learn that it was just less than a thousand years ago (in 1044) that Bagan’s wealthy rulers began building up this ancient city and spent 250 years in doing so. And at the height of it’s place in history as a seat of power in Southeast Asia, the city had more than 10,000 temples and 1,000 stupas! Today there are of course plenty of crumbling, pumpkin-coloured temples, but there are also a great many undergoing careful reconstruction (such as the one below) or have already been restored into modern places of worship with re-gilded exteriors, Buddha statues, and Nats. It’s not often that the history of a place has such a huge impact on us, as our highlights are often about the people we meet or the new skills or ways of life that we learn about. 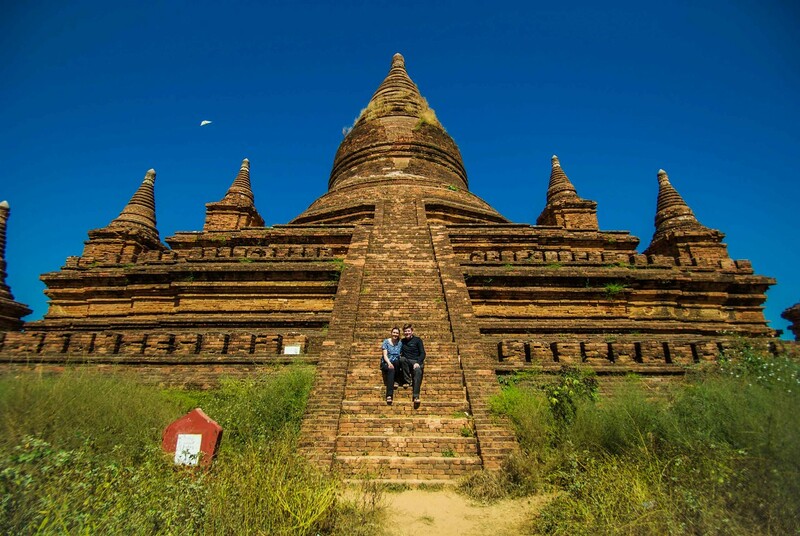 But witnessing the living legacy of the Bagan Archaeological site was a totally unique experience and will forever stand out as a fascinating memory from our time in Myanmar. The temples look so gorgeous. I remember when I first saw a picture of them, I didn’t know where it was but knew I had to go! 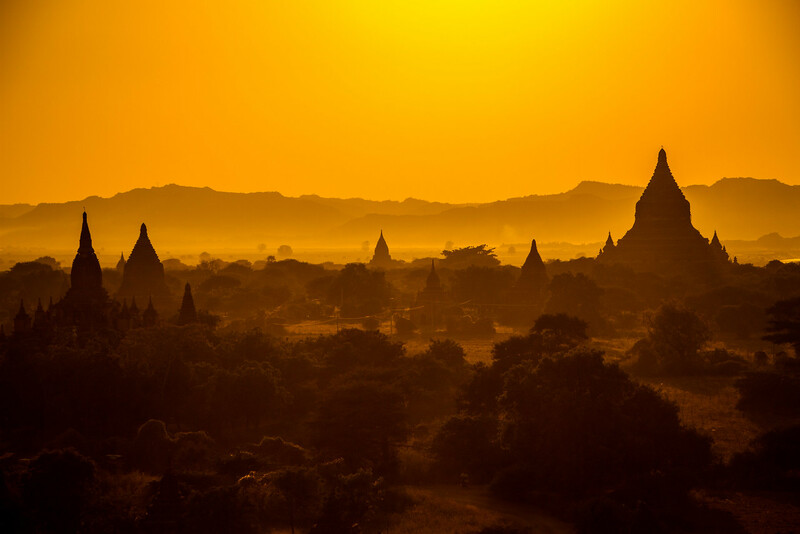 Since then I’ve found out a lot more about Myanmar and it seems like such a great destination, definitely somewhere high on my list. These are such incredible photos!!! 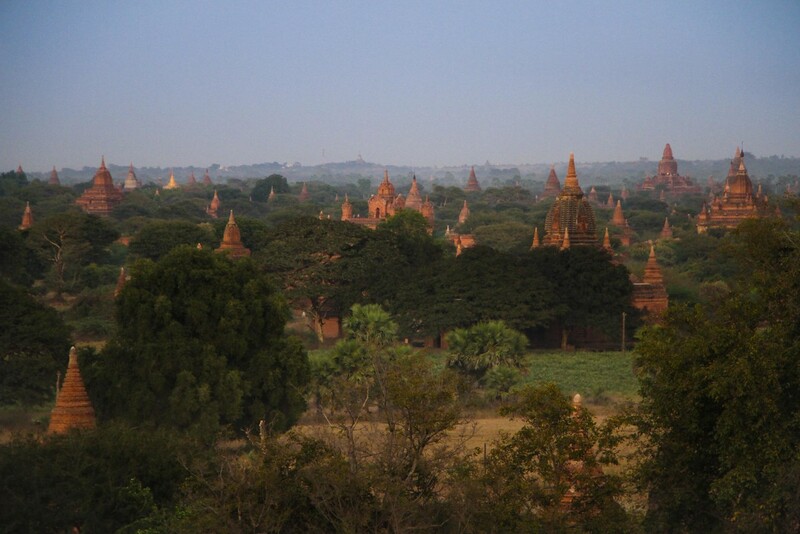 It looks like it hasn’t changed much in Bagan since I visited about 5 years ago. Except for the motorbikes – there were only horse drawn carts when I went.